And now for... A Recipe? This dish was so good that I had to post the recipe. 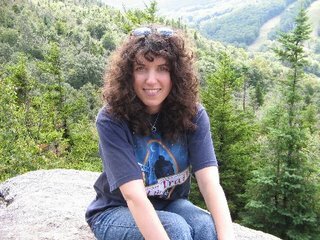 I originally posted this on my Diet, Food & Health Tips blog - http://diettips.blogspot.com. Because this is primarily made from canned vegetables, rather than fresh, you can have the ingredients on hand and whip it up for company any time. I served it as an appetizer, on tiny salad plates. Another way to serve it would be to chop it up a bit more and put it on top of crusty bread - as bruschetta. Don't serve this with a very dry white (see entry on that). I served this with a Vinho Verde, and it worked quite well. This is a VERY low calorie dish. Quarter artichokes and place in dish. Slice hearts of palm into 1/2 inch circles and mix with artichokes. Sprinkle chopped pimentos on top. In a dish, squeeze the juice from the lemon and mix with 2 tbsp of Italian dressing (Viva Italian light is good). 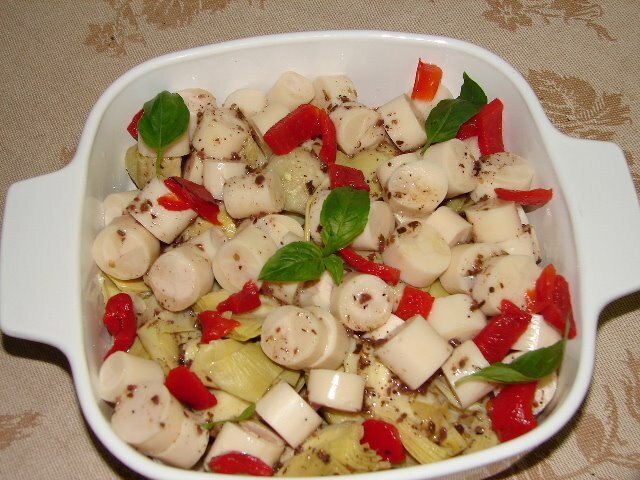 Pour over the artichokes and hearts of palm. Marinate at least an hour and serve individual portions on dishes lined with romaine lettuce leaves. Garnish with fresh basil, oregano or parsley if desired. A friend of mine originally turned me on to this wine. I believe he bought it because of the picture on the label or the name, or both. You may not be able to make it out in the picture, but the label depicts a one room schoolhouse type thing. This wine originates from Paso Robles, California, which is not Napa or Sonoma and therefore is sometimes overlooked as a wine region. 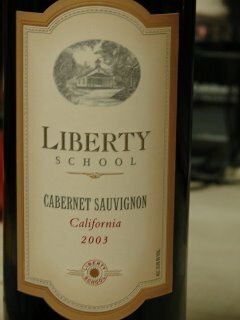 The Hope family owns Liberty School as well as the Treana winery, and has been producing wine under the Liberty School label since 1990. The color is a very dark plum, almost black. The bouquet suggests bowls of fresh ripe grapes, berries and plums - big fruit. The aroma is one of the best parts of this wine. Breathe deep - you'll want to eat it. The taste is very nice - juicy blackberries, with a dry mouthfeel. This is a nice wine to have around and you'll never go wrong serving this with a steak, burger or a pasta with a red sauce. It's a good buy at under $15 a bottle. 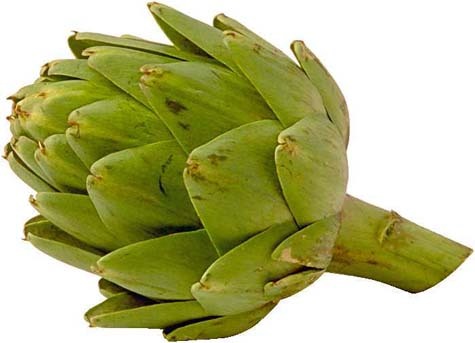 Here's an interesting tidbit - According to the Culinary Institute of America (and they should know), artichokes contain an acid called cynarin that makes accompanying beverages taste sweeter. The Culinary Institute suggests that you avoid serving a dry white or tannic red with artichokes because an unpleasant sweet taste could occur. What would the Manishewitz drinkers think of that I wonder? I read somewhere that almost every single state in the U.S. produces some wine -- when I found out that there was a winery in Alaska, I knew that statement must be true. 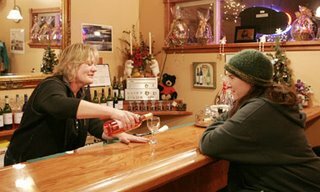 My brother and his wife just returned from a trip to Alaska and while they were there they visited Bear Creek Winery in Homer. Obviously grapes are not grown in Alaska, so the winery uses berries (blueberry, raspberry, cranberry, gooseberry), rhubarb, and other unusual ingredients (ie: fireweed petals) to produce wine. My brother got a bottle of wine for my parents called Black Raspberry wine, which I got a chance to try today. There was no vintage on the bottle (no suprise there), nor was there any indication of what the wine was made from (other than the name). Since my brother knows that my parents are Manishewitz drinkers, he choose an especially sweet wine for them. (The winery itself describes this wine as "A sweeter wine, bursting with true-to-the fruit flavor.") I tried it with some trepidation. The bouquet was of cough syrup or the fruit cordial filling you sometimes get in chocolates - sweet, fruity, and somewhat cloying. The taste was remarkably similar to the aroma - it tasted like raspberry juice cocktail blend with an odd, semi-unpleasant twist at the end. (I guess that was the alcohol). It's certainly not something you could drink very much of, nor is it something that I'm likely to try again, although I will note that my parents did like it. Stay tuned for my review of a drier wine from the same winery that my brother brought back for me - Shirazzberry. My brother also brought back several bottles of Bear Creek's version of Mead (honey wine) for himself. A few days ago, in a posting about screwtops, I mentioned that synthetic (plastic) corks are hard to pull out and even harder to stick back in. It turns out they have another problem that I didn't know about. I was at a wine tasting at Main Street Wine & Spirits - a fine wine store in Port Washington - and I struck up a conversation with the distributor of Bibich, a Croatian wine. I was under the mistaken impression that Bibich was using screw tops. The distributor told me that they are actually using corks, and we launched into a discussion about the pros and cons of corks vs screwtops, and wood corks vs plastic. According to the distributor, if wine is corked with plastic corks and shipped during times when the temperature is high, the corks tends to explode out. The Bibich Winery lost a whole shipment of a rose wine that way - the truck they were being transported in got a bit too warm and all the corks popped out. After that incident, Bibich switched to all natural corks. Anyone else have any feelings about screwtop vs cork, or cork vs plastic cork? While buying a bottle of tres expensive Chateau St. Jean Cinq Cepages (to put away for a VERY special occasion), I struck up a conversation with a fellow at the wine store who recommended the modestly priced Little Chaz Cabernet Sauvignon as a good alternative that I wouldn't feel guilty drinking. So I bought a bottle. It turns out he was right. The wine was a deep, translucent red with a bouquet of black plum and cherry. It had a big, lush taste of dark fruit with a long finish and soft tannins. A smooth, easy-drinking wine with good body. I would definitely buy this one again. 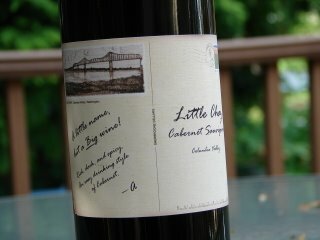 Little Chaz is produced by Sherbrooke Cellars in Columbia Valley, Washington. This particular cab was a 2003 - which some people we know feel was a superior year for wines. Could be, if this was any indication. Washington state is really up and coming in terms of the cabernets they have been putting out lately. Do NOT turn your nose up at a Washington state wine. Give it a try. Yes, He's a Good Director, But Can He Make Wine? I had the opportunity to go to a wine tasting at a fine store in my town, Main Street Wine & Spirits. There were many excellent wines to try, including three from Chateau St. Jean (a winery I mentioned in a earlier posting). The suprise of the night (for me anyway) were two wines I tried from Francis Ford Coppola's vineyard. I tried a 2003 Merlot and a 2004 Claret (pronounced - for those of you who mistakenly thought it was French - like "Clear - Ette"... as in "clear red" which is what the English originally called this wine). Bot wines had unusual aromas. The merlot smelled like an old leather armchair in a smoking club. The claret smelled like lavender packed in moth balls. These are not meant to be negative - the aromas were intesting and unusual and made me want to try the wines. Both wines were smooth and flavorful ... but very different. Which did I like best? Well, we bought a bottle of each, so I really can't say. These were surprisingly good, reasonably priced wines -- worth buying, worth drinking. Don't do what I did, and avoid trying a wine because it's being made by a 'celebrity.' In this case, he deserves an Oscar. Quick - a friend drops by unexpectedly with a good bottle of wine. You need something to serve with it, but you haven't been to the grocery in two weeks. What do you do? Open a can or jar of olives - any kind, black or green will work. Put them in a pretty dish, anf voila! Add a few crackers or a slice of bread. Roasted and salted nuts - especially almonds and cashews - make a great snack with wine. Dried fruit mix - cranberries, raisins, mango, papaya, etc - looks great in a dish and works well with both red and white wines. Fresh fruit - if you've got any. Sliced apples, grapes, strawberries, pear, or peach will all do. Only have condiments in your fridge? Try a small dish of mustard with pretzels for dipping. 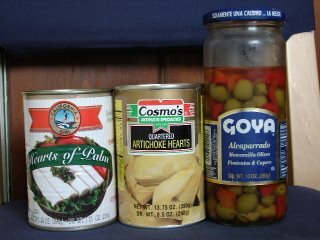 Leftover, cold, cooked veggies sprinkled with vinigrette or Italian dressing make a surprisingly good appetizer paired with bread or a few crackers. Be inventive. In Europe, a few olives and capers in a dish is a perfect respectible side to a glass of wine. Bits of cheese, cut up veggies, hummus or eggplant dip are also elegant. You don't need a lot. However, if all else fails... that half eaten bag of chips will probably work too. Screwtops - Maybe Not So Bad After All? I've had many discussions with my husband Mark about the benefits of cork vs. screwtops for wine. The discussions usually follow the same route - he says that corks are archaic and a pain, and I say that screwtops are an indication of cheapo wine. Then we just drink whatever we've opened and that's the end of it. But recently, while writing an article on screwtops vs corks, I learned some things that made me (at least slightly) rethink my position. First of all, cork taint affects a LOT of wine - statistics indicate that as many as 5% of wines are ruined by it. Plastic or synthetic corks prevent cork taint, but are a bear to pull out - even with a good corkscrew - and are even worse to try to get back into the bottle. New Zealand decided to address this problem by using screwtops for their wine. 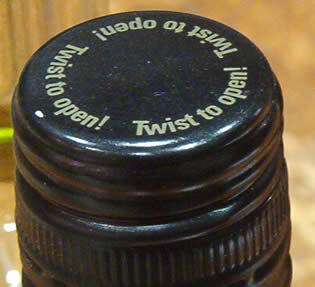 I read a recent statistic that showed that 70% of New Zealand wine is now topped with a screwtop! Other countries have begun adopting screwtops as well, and California's PlumpJack Winery has bottled its high-end reserve wine in a screwtop. Hey - if it's good enough for PlumpJack, it should be good enough for me, right? There are clearly some benefits to screwtops. They are easy to open, easy to reseal, and you don't have to store wine on its side to keep the screwtop damp. You don't need a fancy opener. But there are some downsides too... for example, you don't need a fancy opener. The ceremony of uncorking a wine will be reduced to a twist of the wrist - the same as you'd do for a bottle of Pepsi. Does that take away some of the 'fun' of wine drinking? For some of us, perhaps it does. I'll be interested to see what other wineries adopt the screwtop, and which ones go for alternatives to cork or screwtops - such as glass stoppers. In the meantime, I won't turn up my nose to a screwtop wine.